Yesterday morning was a Monday morning and the weeks’ work was already piled up! I got stuck into getting a report to our Canadian board which I somehow had forgotten. This done and a few emails later, Andy Kuret (our Swiss Canadian pilot) popped his head around the corner. “Clearly you are not ready to go yet! ?,” he stated with a smile. Where did the time go? It was already 08:30 and we were scheduled to depart the mission airfield at 09:00! I still made it to our mission plane with a minute to spare and just in time to help push the plane up to the run-up area. This is the only time (less than a minute) that felt like it took much longer. Breathless, we loaded up and launched for Marromeu, on the Zambezi River Delta. As Andy climbed through the overcast sky, Joao and I collected our thoughts for the meetings ahead. In just over an hour we were descending through broken cloud to a soft landing on the sand airfield. When we pulled up to the end of the strip, the YWAM team was waiting for us. 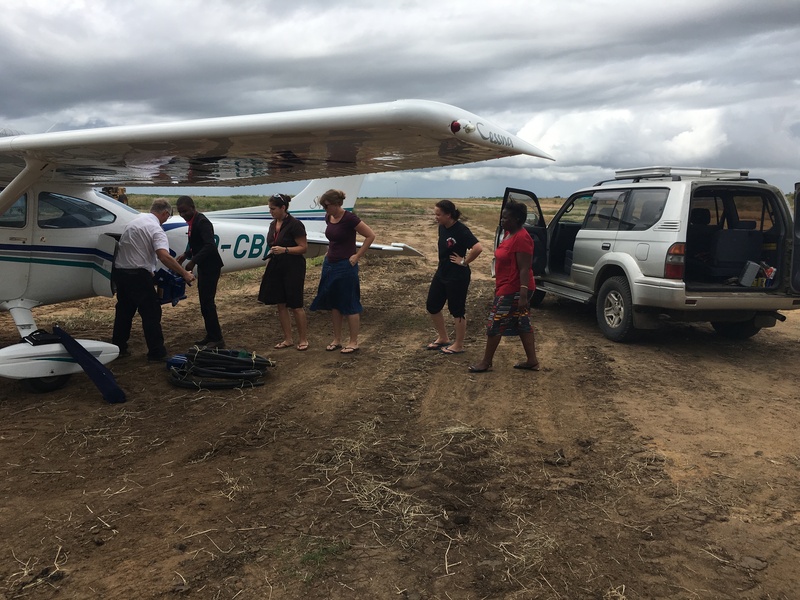 We unloaded three foot pumps that are to be distributed to associations in the Delta in the days to come via helicopter, and pushed Andy out for his flight to Beira. This brief flight already saved us an entire day of travel over very bad roads! After stopping by the police commandant to report our arrival and then dropping off the foot pumps, we walked over to where we had scheduled to meet with a group of key pastors. By now Andy had already reported that he was on route to Beira. While we waited for the leaders to arrive, Joao and I had a productive meeting with the YWAM team less one, since Allison had just come down with Malaria this morning and needed a bed. 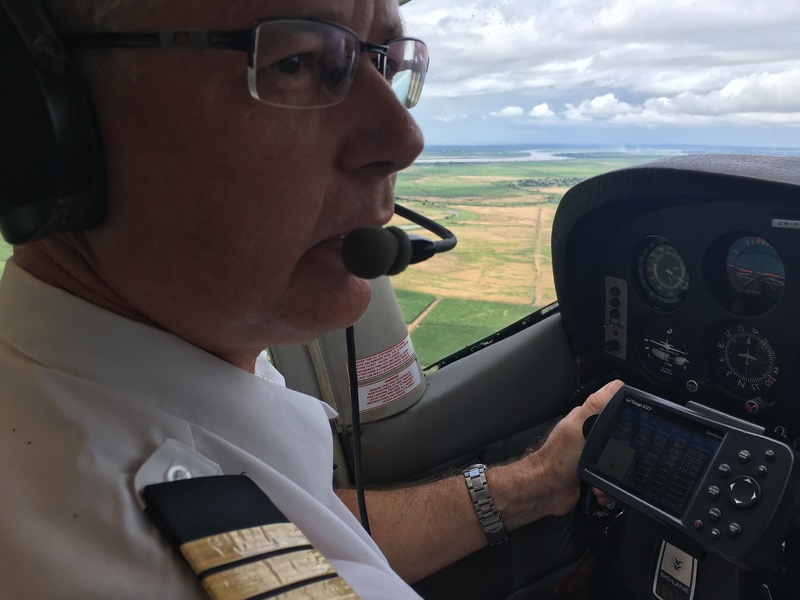 Our cooperation with Mercy Air and YWAM in the Delta is just over a year old and we are identifying where we can each contribute to help meet people’s needs and most importantly meet their spiritual need. Just before starting our meeting with the pastors who had now arrived, I called Andy. 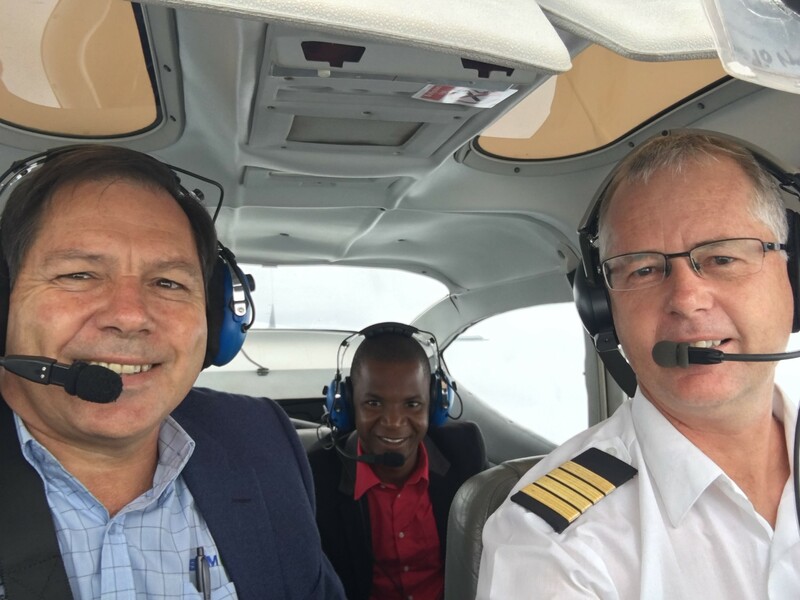 He was safely on the ground in Beira after having to hold in the rain for 15 minutes while other aircraft landed. Even with the 15-minute delay, this flight had saved another full day of travel! Our passengers were there already, so Any estimated he could depart within 20 minutes. 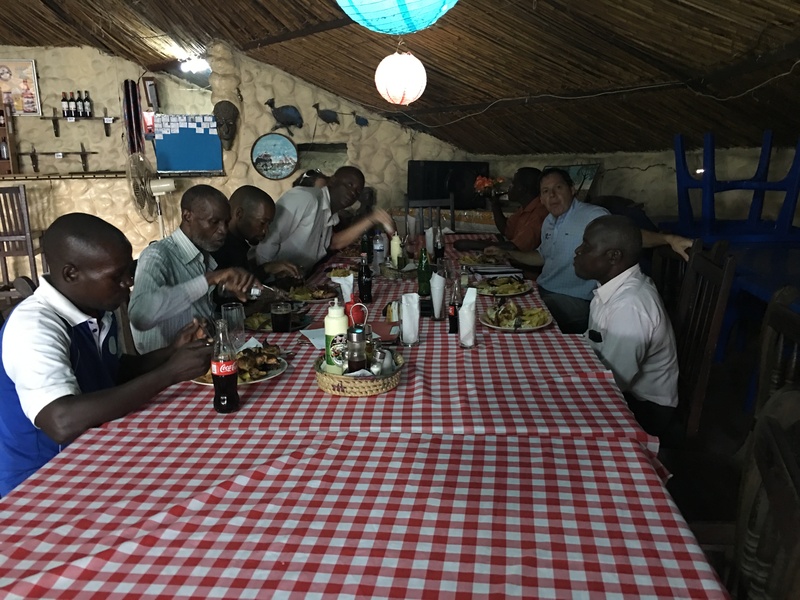 Back in Marromeu, five key pastors had arrived and we were able to share the possibility of them and others enrolling in our Bible and leadership training program. Plans were made to get the information to many others and our YWAM contact Eliza agreed to meet with them within two weeks to see how many of them would like to start their studies. If this goes ahead there will be three new extension schools starting up in the Marromeu area to equip these leaders to more effectively lead and teach their people. Soon after concluding our time with prayer and saying our farewells, I called to see if Andy had arrived. It was raining by now and a little windy, but sure enough Andy had landed safely in the soft rain and was waiting for us. Within 5 minutes we were back at the airfield greeting the two young Swiss gentlemen who had arrived to serve for a week. One a Swiss airline pilot flying Airbus 340’s and the other a military pilot flying Super Puma helicopters for the air force. I could not help but think that they seemed far too young to have made it that far! The older I become, the more time travel really does seem to happen! 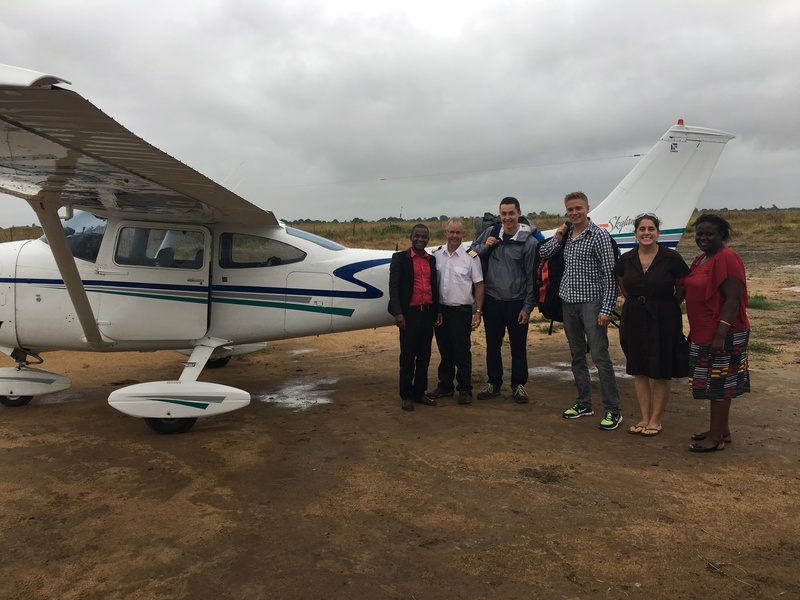 Andy asked if I wanted to fly, but I was so grateful just to be able to take in the blessing that he is to us as mission by serving in this remote of a setting. We took off in the rain, flew through more and were back on the ground at the mission by 16:30. And yes, another day of travel done in 70 minutes. It seems hard to believe, but achieving a number of very important objectives in seven and a half hours which would have taken more than 32 hours of driving over four days really does feel like time travel. We are so blessed to have this capability as a mission and thank you all for your generous support and prayer as we do our best to make the most of the time entrusted to us! Please keep our efforts in the Delta area in your prayers.